This flowmeter is precise and sophisticated. It must be accurately calibrated for application conditions. If in doubt, consult OMEGA’s Flow Department. OMEGA™ FMA-8500 Series high pressure mass flowmeters feature a superior ±0.25% repeatability for accurate measurement and control of gas flow. 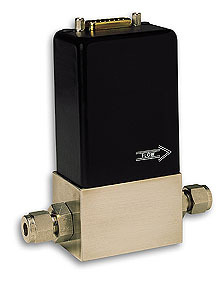 The flow sensor produces a 0 to 5 Vdc output signal linear to the mass flow rate for use in recording, indicating, or control purposes. (*) You must specify gas and inlet/outlet pressure when ordering. 1) Select the core part number from the range code table above. 3) Enter the Constructed part number in the "Order Specific Models Here" table below! 4) You will then add the p/n to your cart and check out with a non-std p/n. 5)We will confirm by email and/or telecon price and availability after the order is placed. Calibrations done at ambient temperature only 20°C(70°F). * Please specify gas and inlet/outlet pressure. When ordering, replace the "*" in the suffix with the gas and inlet/outlet pressure information. For calibrations between 201 and 900 psig; add $600 to price. For calibrations between 901 and 4500 psig; consult Flow Engineering for pricing. For NIST certificate, add suffix "-NIST" to the model number; consult Flow Engineering for pricing. NIST certificate does not include points. All models are custom, consult specification page for complete description and list of available models.